The American Vega Association assumes NO RESPONSIBILITY WHATSOEVER for any transactions or other events resulting from listings on this site. Moondance (hull # 2955) is presently located in Grenada. She is ready to go with everything on her. It includes the mooring which was inspected in April of this year (2018) and lines, swivel and shackles replaced. 1 storm jib, 2 working jobs, 2 main sails (one needs repair) 1 spinnaker. All in fair condition. 2 Bruce anchors, 100 Ft. 3/8 chain, 200 Ft. 1/2 "anchor rode. All plates, silverware, supplies etc. etc. I’ve put every dollar I have into the non-profit and no longer can afford to keep St Brendan. If I could I would keep this boat forever but I am flat broke. St Brendan deserves a good home and she deserves to keep sailing. Al listings below are closed "SOLD"
Fresh water (plastic) 16.8 US Gal (14 imp. gals.). The boat is in Wickford Rhode Island, bottom painted in 2016 and ready to sail. Tarka is currently cruising between the Virgin Islands and St Maarten. Available starting late March in either St Maarten or the VI's. The boat was completely rebuilt in 2005 after her circumnavigation as Tarka the Otter. Beta 14 with 1000 hours. Roller and slab reefing. Spinnaker and storm jib. Achilles dinghy and Tohatsu 3hp included. 155 panel. New Origo. 60+ gallons fresh water. New Raymarine 2000+ tiller pilot. Ready to step on and cruise. Argonaut was my first sailboat and has taught me a lot while sailing the Channel Islands off the coast of Southern California. I am the third owner and have had her for 4 years. But the time has come to get a bitÂ larger boat. The boat is quite original as far as the inside. She is in great condition minus some gel coat crazing, but that has never affectedÂ her great sailing ability. Silentium Was the classic “Barn Find”. The original owner Vernier and his wife Pearl sailed Silentium on Lake Ontario from 1974 through 1982. The boat was sailed mostly weekends from Late May until October, and hauled out and stored each winter. 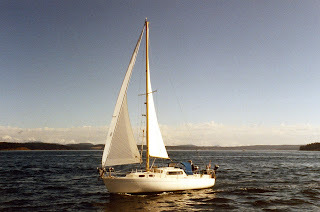 In 1983 the Vernier retired and he and Pearl trailered Silentium to Victoria, British Columbia with dreams of sailing the fabled Pacific North West. Tragedy struck , and Vernier became ill and Silentium was never launched. 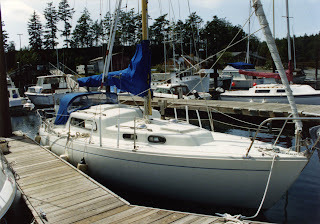 The boat was put into Storage yard on Vanalman Rd, in Saanich and it sat for 28 years until I purchased the boat from Pearl in 2011. The boat was in amazing condition. The old keyhole style orange canvas life jackets looked brand new with no sign of mildew. The boat was dry and sound. Pearl had even paid the yard manager to give the propeller a turn or two once a month to keep the engine from seizing. Of course it had the typical problems of the Vegas. The old haul liner was falling off, the wood work dried out, and the old gate valves needing replacement. So I brought the boat home, put Silentium into the back yard, stripped her down and stent the next two years rebuilding her. This boat is in cruise away condition and is just waiting for the right owner to take on many excellent adventures in safety and comfort. Comes equipped with 8 sails including jibs and a spinnaker (whisker pole too! ), hydraulic autopilot, local charts, custom dinette/chart table, solar panel, and a BRAND NEW C-Head composting toilet. All cushions and wood are in good shape and I have yet to discover any leaks. The original diesel has been long removed and thus she comes with a 8 hp Yamaha outboard that purrs like kitten. I recently had the hull cleaned less than 1 month ago. She'll probably need a coat of paint in the next year but otherwise ready to sail. I am a motivated seller so please contact me either by replying to this post or call the number below. I purchased Albin Vega #3175 this summer. I never got to sail it. I was trailering it down to South Florida before Thanksgiving. A tire blew, the boat flipped on it’s side and was damaged on the starboard side. The boat is fixable but I do not have the skills and the cost of hiring professionals makes this a do-it-yourself project. It was in decent shape before the accident. It does not have an engine. The trailer is shot. The boat is at a yard near Beaufort SC. It should be a good project for anyone with the necessary skills and a way to move it. Any reasonable offer will be accepted and any unreasonable offers will be seriously considered. I was trailering it down to South Florida before Thanksgiving. A tire blew, the boat flipped on it’s side and was damaged on the starboard side. See pictures attached. The boat is fixable but I do not have the skills and the cost of hiring professionals is not feasible. (formerly Peter Jacobs' SIN TACHA) is for sale. We bought WALKABOUT from Peter in March, 2013 and have planned and equipped her for extensive sailing adventures. We recently completed a three month+ cruise to the northern end of Vancouver Island and through the San Juans, Gulf Islands, and the rugged, breathtaking Broughtons. Sadly, age-related health problems for both captain and mate have convinced us to make the painful decision allow someone else to enjoy our lovely little ship. Replaced original buss bars and fuse blocks replaced with a Blue Seas DC 13-position circuit breaker panel for onboard DC electrics. Added (2) plug-in outlets for charging phones and laptops. 3/27/2013 - Full Marine survey completed. Copy on board. 4/24/2014 – Haulout at Yacht Haven Marina, Port Townsend, WA. Bottom stripped, epoxy barrier coats and new anti-fouling, standing rigging replaced, cutless bearing replaced, new mast wiring and wiring race, new coax, electrical upgrades, etc. Yanmar 2GMF freshwater cooled two-cylinder diesel. Rated 13HP. The engine is in good condition for age, runs well, and is very clean. It consumes approx. 1.75 liters (about 0.46 gallons) of fuel per hour at about 2600 RPM/5.5 kts. 32 liters (approx. 8.4 gallons) for approx. 18.25 hours running time at 2600 RPM. Previous owner had the fuel tank cleaned and pressure tested. Batteries: 2014 - New AGM batteries installed consisting of two 6-volt house batteries and one 12-volt starter battery, wired to master switch. :>Original wood throughout. Very clean, with less-than-expected wear for age. :>Standard Vega layout with galley aft P&S, salon settees P&S forward of galley, head and hanging locker opposite amidships, V-berth and anchor locker forward. :>Surprising amounts of storage under salon berths, behind salon seat backs, in galley, in lockers next to head, in hanging locker opposite head, under V-berths P&S, and under V-berth cushion. :>Standard Vega three seat hatches provide large amounts of storage. :>Stern anchor, spare parts bin located located in lazarette. :>Cockpit cushions, by previous owner. :>(2) solar panels wired through a charge controller(came with boat). Charge controller mounted on electrical panel. Solar panels work great. NOTE 1: The new owner must re-register the MMSI number and update the emergency contact info. :>Stern/spare Anchor: Danforth 14 lb. with 25â€™ Â¼â€� chain and 150â€™ Â½â€� nylon rode in lazarette. :>Fenders: (4) fenders, (3 NEW in 2014). The deck needs to be painted and the canvas (dodger, sail cover and weather cloths) should be restitched. :>Various engine spares including belts, oil and fuel filter spares, washers, misc. hoses, impeller, engine and transmission oil, funnels, oil absorption pads, spare drinking water filter element, etc. :>Red LED chart light on flex shaft, starboard aft main bulkhead. :>Milltech SR-161 AIS receiver and antenna with USB-to-serial adapter; compatible with various marine nav apps (I use GPSNavX on a Mac as backup to the AIS on the VHF). :>All (4) bronze seacocks in galley (sink drain), head (intake and outflow), and engine raw water intake. LoFrans windlass, Bruce anchor. Radar and Wind vane. Force 10 heat. Brass bulkhead lamp. Force 10 cooktop. Split galley. Updated breaker panel. Just 450 hours on new Beta engine. New transmission, exhaust, prop, shaft, etc. Tiller steering, dry cockpit. 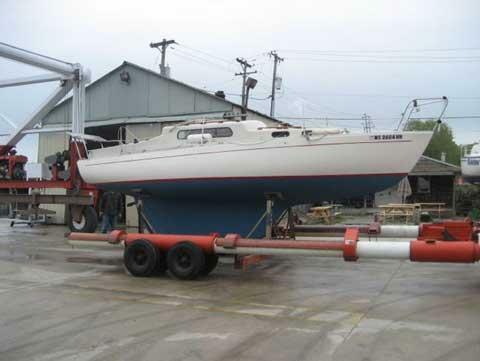 The 27 foot Albin Vega is ranked 5th out of 20 boats for seaworthiness and was included in John Vigors book,"Twenty Small Sailboats To Take You Anywhere". 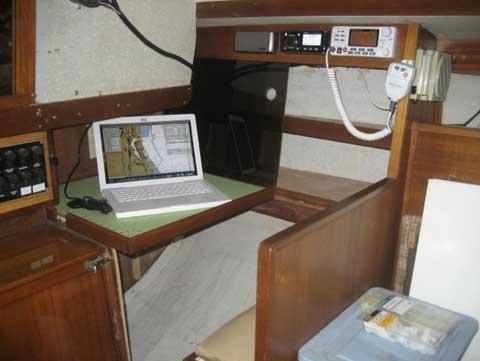 An easy working interior for passage making or inland water cruising. Sink and ice box to starboard, followed by a 6 foot 2 inch berth going forward. A new (2011) Jabsco head and stainless steel tank forward of the berth. Wet locker is across from the berth to port, with a smaller berth aft and a Nav station aft of the berth. Ample V-berth configuration sleeps two adults easily. Original cabin table is also usable in the cockpit. • Avon Redcrest 8' inflatable dinghy - WHAT DO WE HAVE? Boat is pretty stock. head and inboard have been removed. Outboard bracket on transom. Rig and sails look good. Deck has crazing in gelcoat. Window rubber has shrunk from age and inner fabric liner has been removed. Interior has been left stock has table, one modification was the addition of a fold up berth on portside settee. Please contact me with any questions. Selling local and reserve the right to pull listing if it sells. Boat is located in Bristol Maine 04564. 1974 Albin Vega 27. Hull 24170774. Basic original condition. No damage history or indication. Moving, must sell. Very good condition. 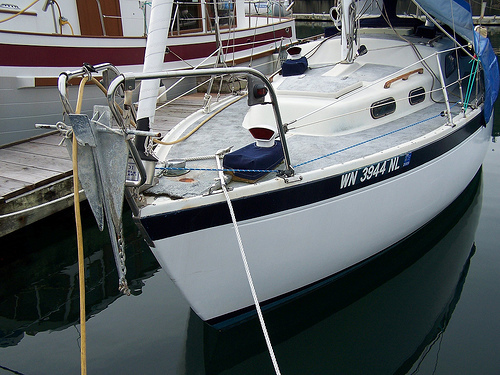 New bottom paint, deck paint, battery, complete electrical system, main sail, lines, deck and bottom paint last year. Depth finder, autopilot, stove, sink, head. Outfitted as offshore cruiser. Genoa, jib, and storm sail. Extra anchor. Original Volvo Penta engine and drive train. Oil analysis indicates high wear, however, engine runs good and does not smoke or use oil. Very solid. $10,000 or best offer by 6/12/10. Contact Brock Weidner at 907-321-3855 or LawNorth2000@yahoo.com. I have owned the boat for ten years. A previous owner had outfitted the boat for cruising. A standard joke when I take friends sailing is that something will need repair and I will rummage around in a lazarette or a locker below and appear with a replacement part. When asked where I got it the answer is invariably "It came with the boat!" Sale of the boat will include everything that comes on the boat. It is a garage full of equipment. In fact my advice is to do what I did. Empty the boat and then re-stow and label the location of every imaginable piece of equipment or replacement part. I truly believe you could literally provision with food and water and embark on a cruise! I'm mellowing with age and like time share vacations! I can get my sailing fix by chartering anywhere in the world! 2 years ago I was out solo in weather between Anacapa and Santa Cruz. My mainsail blew out and a following sea backed up the engine exhaust. Caught with only a headsail and being blown down the coast I maydayed and the Coast Guard towed me in. and emergency flares). Additional addendum: despite my foolishness "Julie" to care of me. She never felt unseaworthy. I called mayday as I didn't relish being blown down the coast all night with only my headsail. Running rigging: Main is all rope. 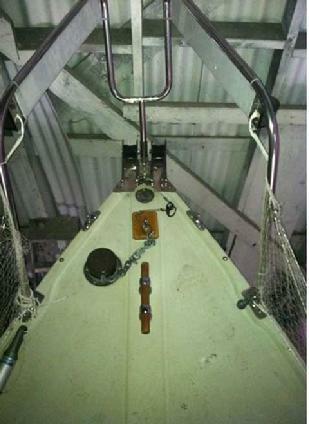 Headsail and boom lift are original rope and wire. V berth has memory foam attached to original foam cushions for a very comfy bed. $$$$$$: $15000 firm. I stole the boat for $14000 ten years ago. There is easily $10000 of beyond basic Vega upgrades on this vessel. Come out with me for an overnight to the Channel Islands and I am convinced that "Julie" will win your heart. 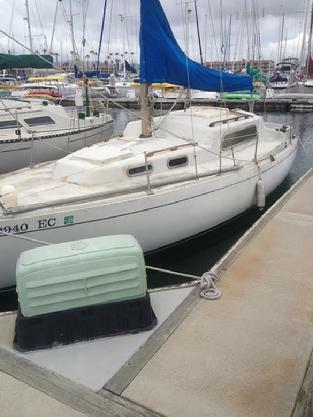 This boat is in good condition and ready to sail away. Many sails- 2 mains, working jib, genoa, storm jib, and crusing spinniker. 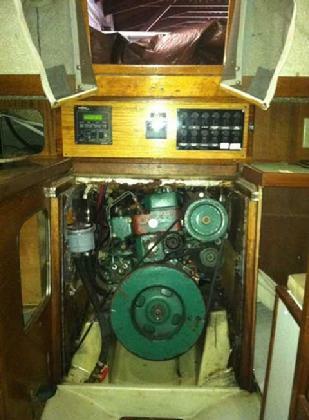 Original volvo-penta MD6A 10 hp diesel - 1176 hours on the clock- runs fine. New 2008 additions include: shore power, dual battery charger, electric bilge pump and depth sounder/chart plotter. Out of water survey done Aug 2, 2008. We have loved this cozy, classic Swedish sailboat for 24 years, but health issues have made this decision for us. Proven offshore and coastal cruiser (previous/original owner sailed her to New Zealand, Australia, Tahiti, Hawaii and back to the Northwest. Then shipped her to Florida and sailed to Iceland. Then trucked the boat to Seattle and sailed to Aleutians and Russian border). Port and starboard salon berths convert to king-sized bed! Newport Dickinson heater and much more. Ukiyo, Vega hull #377, has been stored on her trailer for ten years. It is time someone set her right and put her back in her element with wind in her sails. David knows that that will not be him so he his offering her, complete with trailer for only $1500. Click THIS LINK for many more photos and more details. Ukiyo is located in Groton, MA. David can be contacted via email to arrange a showing.